Today was an awesome day (as it should have been). Although we woke up to the return of the frozen desolate wasteland winter wonderland literally frozen in time, this day warmed my heart and my soul. We were hoping the roads would thaw out a bit so we could go to Mass at noon today, so we ventured out, in the truck, just after 9:30. The road was amazingly clear (and dry)! We stopped by the church office because I had to ask some questions about a special project I am working on, and we were surprised at how clear the parking lot was. My photos yesterday clearly showed the thick layer of ice everywhere, but this morning things were amazingly better. Soon after we returned home I got a call from the church, asking me to make a run to a local grocery store which donates food from time to time. The normal “pickup” person could not get out of their driveway due to the ice, so they asked me to make the run for them. I am constantly amazed, and it warms my heart, to see the amount of food donated to our church. There are a lot of people who truly benefit from that selfless gesture. We returned home just in time to pick up the kids and get back for Mass. Father Rafael returned from his trip to Puerto Rico, so Mass was extra special this afternoon. He often comments that Puerto Rico is the Holy Land, and for a couple days there I thought he may be right, since hell froze over while he was gone. Everything has been cancelled this week. 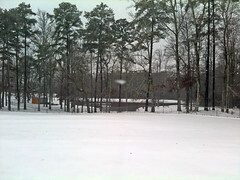 School, church services, and meetings have all been cancelled due to ice and snow on the roads. But tonight, finally, something wasn’t cancelled, and that was Eucharistic Adoration. My wife attends each week, but I usually have Scripture Study that same night so I make dinner for the kids and leave for class just as my wife returns from Adoration. Since Scripture class was cancelled because of the roads, I was able to attend Adoration tonight and let me tell you, I am so glad I did. I received “The Blessed Sacrament Prayerbook” by Father Lasance as a Christmas gift from my mother-in-law. I have to say, it’s one of my favorite books, and I have been anxious to use it during a Holy Hour of Eucharistic Adoration. Having that book tonight was invaluable, as it helped me form my thoughts and prayers and allowed me to focus on nothing but my hour with the Blessed Sacrament. The focus of Holy Hour is Christ in the Garden of Gethsemani. When the disciples had fallen asleep, Jesus asked, “Couldst thou not watch one hour?” and this is our way of spending that hour with Him. It was awesome! If I had not had my prayerbook I might have fallen asleep like the disciples, but thankfully I didn’t have to worry about that as I had plenty of material to keep my mind focused and alert. The church was very cold this evening, due to the cold wind blowing (and the thermostat being turned down very low), but as the hour progressed my heart had never been warmer. Now I know where the term, “cold hands, warm heart” must have originated, but I’m already looking forward to next week.